The boards of directors of the 12 Federal Reserve Banks are important decision-makers and influencers of national monetary policy. Designed to bring voices from diverse economic perspectives to the table, Federal Reserve directors have historically—and dramatically—failed to adequately represent communities, consumers, employees, women, and people of color. The boards of directors of the 12 Federal Reserve Banks are important decision-makers and in uencers of national monetary policy. Designed to bring voices from diverse economic perspectives to the table, Federal Reserve directors have historically—and dramatically—failed to adequately represent communities, consumers, employees, women, and people of color. Banking and commercial sectors have increased their already-outsized share of board seats since the most recent GAO study of this issue, in 2011. Representation of the service sector has shrunk, despite the sector’s growth. Organizations governed by community members and employees continue to represent less than five percent of all seats. While 63 percent of the nation’s population is white, 83 percent of Federal Reserve board members are white. Similarly, men make up nearly three-fourths of all board members, despite constituting 49 percent of the US population. 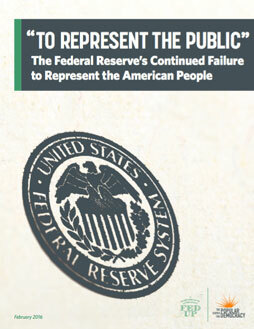 While many of the Federal Reserve Bank presidents have spent their entire careers staf ng the Federal Reserve and/or bodies of federal government, banking is the next most common career path to a Fed presidency. For instance, one-fourth of current presidents had strong ties to Goldman Sachs before becoming a regional Bank president. Ninety-two percent of presidents and 100 percent of voting FOMC members are white. Eighty-three percent of presidents and 60 percent of voting FOMC members are men.